Alien: Covenant feels as though somebody facehuggered Prometheus and ended up with Alien. It is a very messy, very awkward, very clever piece of film. It is a genre movie that understands both what it wants to be, and also the reasons why it cannot be what it wants to be. It is a film aware of its own grotesque attributes, of the way that it has been warped and deformed in its journey from original idea to concept to screen. It is a movie very much aware of what it wants to be, but it is also cognisant of the fact that it cannot be that film. Alien: Covenant is the result of any number of compromises, but it is very pointed on the subject of those compromises. Most likely driven by the critical and audience reaction to Prometheus, the sequel is a decidedly more conservative affair. For all intents and purposes, Covenant is wed more tightly to the Alien franchise than to its direct predecessor. Although one main character (and performer) carries over from Prometheus to Covenant, most of the major characters from Prometheus are relegated to small supporting roles and cameos. Even the Engineers, the alien race at the centre of Prometheus, are primarily relegated to an extended flashback sequence. In contrast, Covenant embraces the trappings of the familiar Alien franchise. The soundtrack repeatedly samples Jerry Goldsmith’s iconic score from the original Alien. The climax devolves into a hybrid of the most iconic action beats from the first two Alien films. The film lingers on the dramatic reveals of familiar Alien iconography, only barely teasing audience expectations before fulfilling them. It seems fair to argue that Covenant is a movie more consciously designed to appeal to fans of the Alien franchise than Prometheus was. The clue is in the title. However, Covenant is most interesting when it plays up the tension between what it clearly wants to be and what it actually is, when the script throws the concept of sequel to Prometheus into conflict with the demands of a prequel to Alien. There is a strong sense of disillusionment and frustration in Covenant, particularly as explored through the story of David. Michael Fassbender’s enigmatic android is the only major returning character from Prometheus, and in many ways the central character. He reappears after being lost in the wilderness, angry and resentful. Covenant is a big ball of Oedipal rage. It’s clever, awkward, messy and disjointed, but also entirely in keeping with the themes of the larger series. It feels strange to see the black oil after such a long time. Technically, the last time that the black oil was brought up was in Two Fathers and One Son, where it was retroactively confirmed to be the “Purity” alluded to in The Erlenmeyer Flask. However, the last time it was an active plot element was really The X-Files: Fight the Future. After that, it lost amid plot developments involving gestating aliens and faceless rebels. So, in a way, putting the black oil at the centre of Vienen feels just a little surreal against the backdrop of “super soldiers” and other more immediate concerns. Vienen feels very old-fashioned. Even the structure of the episode harks back to the first season mythology episodes, when the show was allowed to use aliens and conspiracies without the burden of tying them to a larger narrative. It features the black oil, but Vienen feels closer to Fallen Angel or E.B.E. than Tunguska or Terma. Trying to tie it into the larger plot of the mythology is an exercise in futility, but that is not the point here. Vienen is no more or less a mythology episode than Empedocles, despite its inclusion in the “mythology” DVD collections. It is an excuse to bring back an iconic baddie for one last run-around with Mulder, continuing the orderly transition of power from the what the show was to what it might be in the future. ‘When Alexan­der saw the breadth of his domain, he wept for there were no more worlds to con­quer.’ Ben­e­fits of a clas­si­cal education. In hindsight, “ending” the mythology with a two-parter in the middle of the season was always a risky proposition. Airing Two Fathers and One Son during February Sweeps was a logical decision. Ending the mythology that had been running through the show for five-and-a-half seasons was certain to grab the attention of casual viewers, reeling them in to boast up ratings. 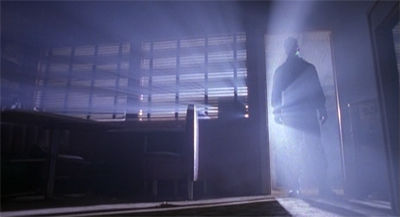 The X-Files had always aired mythology two-parters during Sweeps, putting them forward as examples of the best that the series could do and cementing the show’s claim to be “blockbuster television.” Choosing to wrap up the mythology during February Sweeps was just an extension of that approach. And it worked. Two Fathers earned the second highest Nielsen score of the sixth season, landing just behind The Rain King. Two Fathers was the last time that The X-Files would rate so highly. As such, the decision to “close off” the mythology in the middle of the season was a very shrewd decision. However, it did raise questions about what the show would do at the very end of season. After all, The X-Files liked to bookend its seasons with mythology episodes, counting on a mythology cliffhanger to carry viewers across the long gap between seasons. How do you tell a mythology story when you’ve just worked so hard to tidy it all away? The opening shot of The Beginning makes it quite clear that things have changed. The camera opens staring at the sunny cloudless sky of California, doubling for Arizona. It pans down to an open desert. As the production team conceded with Anasazi, the desert was just about the only American environment that Vancouver could not easily mimic – to the point where the team had to paint rocks red in order to convincingly set a scene in New Mexico. California makes for a much more convincing desert. The contrast is striking. The sixth season of The X-Files is bright and sunny; it is aware of its new production reality and chooses to embrace them rather than pointlessly resist them. Things had changed, and there was nothing to be gained from pretending otherwise. It is no wonder that the opening sequence of The Beginning features a group of working-stiff conspirators in transit; the perfect opening image for a season still figuring out how Los Angeles works. The Beginning loads all of that into its opening shot, getting it out in the open before it gets down to business. At the same time, The Beginning is keen to stress that not too much has actually changed. The naming of the fifth season finalé and the sixth season premiere is decidedly symmetrical – The End and The Beginning. In fact, naming the second part of a two-part episode “The Beginning” is a very clear attempt at reassurance. It is a beginning without actually being a beginning; it is a conclusion without actually being a conclusion. The wheel keeps on turning. All that is missing is the ouroboros. The closing shot as much as confirms this, revealing that the bold new alien design revealed in The X-Files: Fight the Future is not so bold and new after all. Instead, the monster obviously inspired by Alien is something of a missing link, a tether connecting the grey aliens seen in episodes like Duane Barry to the black oil introduced in Piper Maru. It is all one big circle in perpetual motion. Everything is connected. Everything fits together. The show might have moved two thousand miles south, but it hasn’t missed a step. For better or worse, The Beginning is about assuring viewers that – no matter what has changed – everything remains the same. It is up to the viewer to decide whether that is a good or a bad thing. Silent Enemy is very much a game of two halves. It’s an episode that suffers from the decision to incorporate two radically different plots into a single episode. In many respects, it’s a show that suffers from Star Trek: Enterprise‘s decidedly old-fashioned storytelling aesthetic: the sense that most hours of Star Trek need to have two plots running through them for pacing and structural reasons. This storytelling technique is a decidedly outdated approach to television, reflecting the narrative conservatism at play in the first season of the show. Silent Enemy is built around two plots. The primary plot sees the ship coming into conflict with a bunch of strange predatory aliens who do not respond to attempts for contact, and who grow increasingly belligerent over the course of the episode. Archer and his crew find themselves facing an opponent far stronger and more aggressive than they are. It’s a pretty bleak, pretty heavy plotline. Inevitably, the show decided to pair it with something a bit more light-hearted, so we get Hoshi trying to figure out what Reed’s favourite food is that Chef can bake him a super-special birthday cake. While the combination of plotlines isn’t the worst in the history of the franchise – the episode doesn’t feel like Frankenstein’s monster in the same way that Life Support does, for example – it’s still rather incongruous. Silent Enemy is an episode weakened by the decision to combine these two into a single story; the desire to offset the doom of the “Enterprise under siege” story with something a bit more easy-going and comedic. There is a generally funereal atmosphere to the last few episodes of Space: Above and Beyond, creating the sense that the show was well aware of – and had perhaps come to terms with – its own inevitable cancellation. Stardust had assured viewers (and the show itself) that the dead can be heroes too. Sugar Dirt seems a lot angrier about the series’ situation. It is the story of our heroes surrounded and outgunned on all sides; abandoned to their fate by those in authority.